The disasters of the past year have filled our hearts and headlines with devastation, grief, and profound shock. We send our deepest love, compassion, and strength to those around the world who are now living in the aftermath of these disasters – rebuilding a sense of home, mourning lost ones, and making sense of their new reality. We are greatly humbled and inspired by the powerful Just Recovery work that is happening every hour of every day by people-powered organizations in each of these places. Thank you, to those on the ground for your leadership and determination. We are with you. You are not alone. The chaos of this moment confirms what we’ve known about climate disruption – its power to devastate along lines of existing inequality is no accident, and because of that, recovery must be led by the people on the frontlines. These crises of climate disruption are a consequence of the many crises hitting each of these communities. The acute is meeting the chronic; when disasters hit a community under attack by pre-existing systemic forces of oppression, we witness and experience explosive moments of devastation for the land and the people in those places. This begs us to recognize that response efforts cannot just band-aid the immediate damage of the disasters, but must be situated in long term vision and strategy that puts justice at its core. These moments make intensely visible the ongoing war that has been egregiously waged on life and the resilience of people and the land for centuries. In the aftermath of such disasters, extractive forces continue that war through harmful development, predatory lending, opportunistic neoliberal policies, and other disaster capitalist practices. Unfortunately, we can undoubtedly expect these disasters to continue hitting our people as the ecological and economic crisis plays out, and as chronic slides of systemic oppression intensify. Yet, we also know that communities are exercising incredible people power and visionary strategy in these moments of disaster. 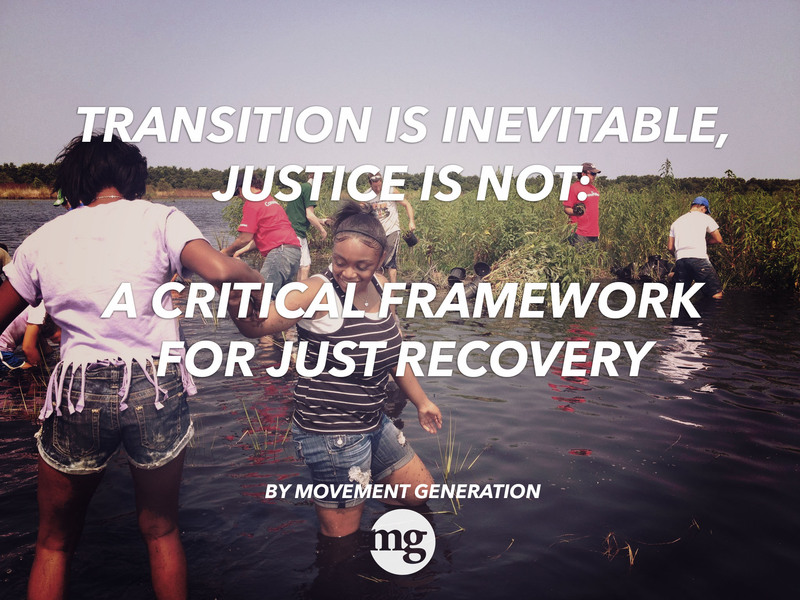 The vulnerability of the extractive economic system and the urgent calls to rebuild and recover bust open the possibilities to build a Just Transition and to radically shift towards the regenerative, resilient economies that we need. Now is an opportunity to allow our organizing to be guided by this collective strategy, to reground in visions of self determination and self governance, and to build our way out of chaos together. People in the US and abroad have already begun to practice this through post-disaster organizing efforts increasingly known as Just Recovery. 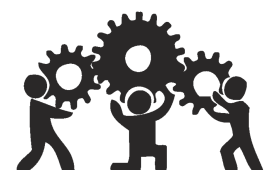 Disaster collectivism describes the way communities radically come together, both forming new and building on existing networks of mutual aid, to take care of each other in the immediate aftermath of disaster. In these times, people are meeting their own needs their own way and prioritizing care for each other, especially those hardest hit by the disaster, often in the absence of adequate government response. Disaster collectivism sets the stage for long-term collectivity and deep democratic self-governance, and moves communities forward in their own Just Recovery processes. Just Recovery resists disaster capitalism at every step – from the disaster collectivism that models people-powered, heart-centered, socially just relief to the long-term organizing and actions that reclaim the right of peoples to define their economies and govern their communities. By organizing directly to meet our needs, particularly in these moments, we exercise our rights, demonstrate our resilience, and resist the imposition of neoliberal policies at every level. We are inspired by those asserting Just Recovery as a vision and practice, in the wake of disaster, and who are forging a path we must all learn to travel. We are learning from you. The term Just Recovery has been used from the #JustHarveyRecovery website to the calls for a Just Recovery in Puerto Rico. The powerful efforts for Just Recovery across communities – not just this year, but throughout recent years – have reflected the incredible and inspiring reclamation of care and sacredness and the building of collective power. 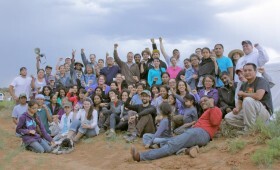 Just Recovery is organizing in our communities today to build the right soil of resistance and resilience (literally and figuratively), and to build right relationship with land and each other, so that we are not only ready to just withstand these oncoming shocks, but so that we are prepared to use them in those moments to fuel a revolutionary peoples’ movement. We’ve been inspired by peoples everywhere who are pursuing a Just Recovery by rooting their practice in core principles: creating root cause remedies, practicing revolutionary self-governance, asserting rights-based organizing, demanding reparations, and advancing ecological restoration for resilience. Guided by the leadership of communities building and re-building home everywhere post-disaster, we humbly offer this framework for a Just Recovery. We offer it to those on the ground who are organizing their people. We offer it to those on the frontlines of all social, economic, and ecological struggles – who are preparing for the possibility of disasters in their future. See that these strategies are everywhere, create conversation within community and across movements. In the midst of instability, people are manifesting. 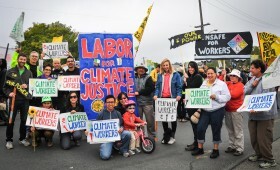 One critical principle of Just Recovery is that it creates root cause remedies – building towards recovery in ways that account for and address the underlying structural inequalities that set up hurricanes, wildfires, and other disasters to become more powerful and more frequent, and that hit poor and working class communities of color hardest. Climate disruption is the emergent consequence of the exploitation of land and life everywhere. It is an existential threat to humanity born from over 500 years of global warfare, the myth of white supremacy, and colonialism against real people in real communities every day – from the first colonial boots in Africa to the black, brown, queer, and crippled folks murdered by the police and military forces everywhere. Because disasters are situated in this interlocking, historical, systemic reality, Just Recovery efforts to rebuild communities in the face of disaster must not stop at immediate rescue efforts. Additionally, they must build towards long-term root cause remedies that take on systemic oppression and the extractive economy that makes it possible, so as to reorient us towards economies based on our social and ecological well being. t.e.j.a.s. (Texas Environmental Justice Advocacy Services), Houston’s oldest environmental justice organization, has been grounded for decades in the communities that were hit the hardest by Hurricane Harvey this year. From the beginning, t.e.j.a.s. has shown that a Just Recovery must include naming of the unjust structural and material conditions of Houston that enabled Harvey to be the disaster that it was. For example, this 2016 article and interactive map from the Texas Tribune and ProPublica, explains how unrestrained development and neo-liberal policies put the city of Houston at increased vulnerability to catastrophic flooding. A system of continual extraction and greed set up the conditions for Harvey to be not just a big storm, but a disaster for Houston’s poorest. t.e.j.a.s.’ recovery efforts build with these realities at the core, and include solutions that address and aim to shift those conditions. After the storm, t.e.j.a.s. distributed re-entry kits to help people safely remove toxic chemicals from their flooded homes when they returned home. This focus on providing people the tools to take care of themselves and build community health has led their recovery efforts post-Harvey. As a part of this, their work highlights the threats they have lived with for years, aiming to educate people on the dangers they face and challenge the roots of those dangers. Bryan Parras, who works with t.e.j.a.s., shows the historic and constant sites of toxicity in Houston in this “toxics tour,” and speaks on them more in this interview (beginning 18:30). Multiple Superfund sites were flooded during Harvey, and the amount of contamination is impossible to know. For them, recovery must take these conditions into account and focus on long-term health. In moments of disaster, our communities will be abandoned by the powers that be. We must demonstrate that our ability to self-govern is better at meeting our needs than the corporations’ or state’s supposed mandate to govern. And we must not just govern under the existing structures; rather, we me must remake the shape of governance to be more democratic and ecologically responsive – from the state house to the workplace to the blocks where we live. For too long the people who live and care for the places they call home have been intentionally dispossessed of the decision making power to govern their home. 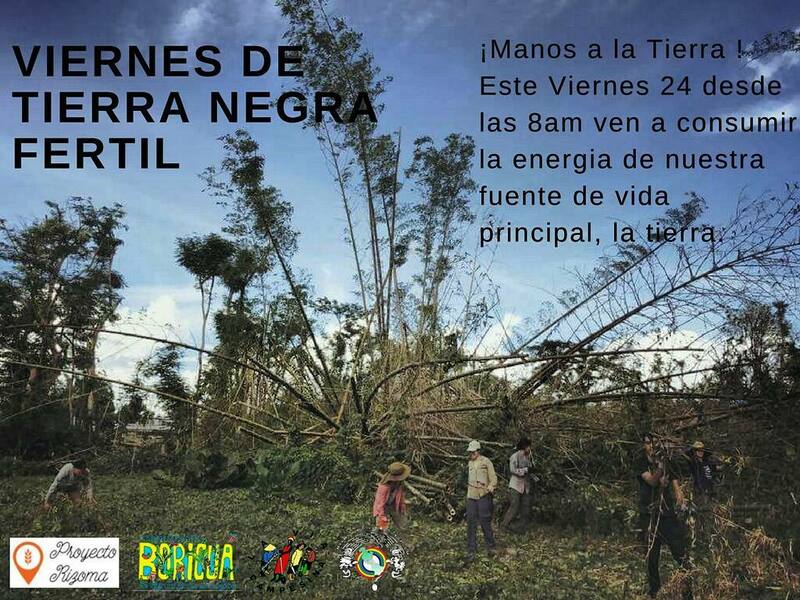 In moments of disaster this unjust power dynamic of the Extractive Economy leads to harmful, unaccountable decision making that doesn’t put the wellbeing of people and the land at the forefront of recovery. It sets up the same oppressive systems of power to lead not just the recovery efforts, but the economy and infrastructure that is built in the disaster’s wake. 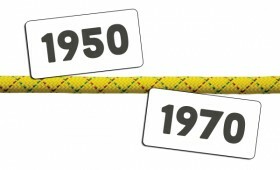 Just Recovery efforts have been boldly, and necessarily, characterized by acts of self governing through crisis – acknowledging that the people most impacted are those who know how to take care of their people and the land best, while unveiling the blatant shortfalls of the existing institutions in power to do so. In the very crisis moments of the disaster to the years (decades) of rebuilding and recovery efforts that follow any disaster – this is our moment to assert the people’s right to make the decisions that impact their daily lives and the future of their home. 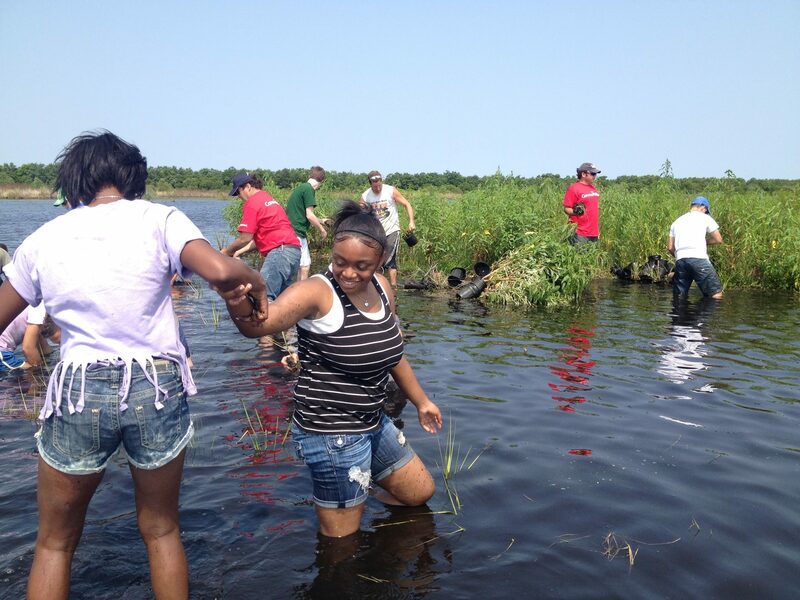 Communities are utilizing the moment to draw power down to local levels, where they can be in more direct control of the land and the resources they depend on. Their response efforts create a resilient organizing infrastructure that builds people power through unique and unified coalitions and community-based formations that will last well beyond the the acute moments of disaster. OCCUPY SANDY | NEW YORK: Even before Superstorm Sandy hit New York City & New Jersey in Fall 2012, networks of organizers and community members were mobilizing to lead recovery efforts on their terms. Occupy Sandy is “a grassroots disaster relief network that emerged to provide mutual aid to communities affected by Superstorm Sandy.” Occupy Sandy supported some of the most vulnerable New Yorkers who were hardest hit by the storm, who were not being served by government or NGO relief services. Organizers of Occupy Sandy, which grew out of the Occupy Wall Street movement, saw the injustice in the federal response to Sandy and built a different recovery. 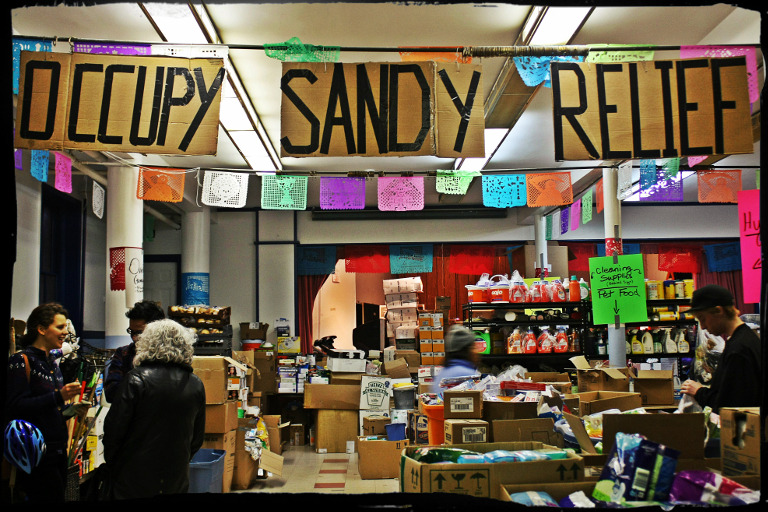 Under the banner “mutual aid, not charity,” Occupy Sandy challenged traditional relief practices and countered with their own, rooted in people-to-people support and a vision of shifting unjust power structures, in relief work and beyond. 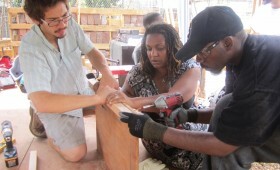 Their ability to build and draw on community networks in recovery was so powerful that even the Department of Homeland Security praised Occupy Sandy’s work, noting that it was more effective than FEMA. We believe that Just Recovery must be characterized by an assertion of the peoples’ right to the resources required to create productive, dignified, and ecologically sustainable livelihoods. 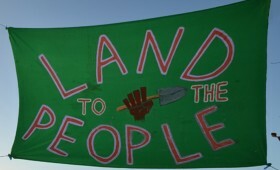 That means asserting the right to land, clean water, food, and other resources needed to survive. Remember that rights are not given and rights cannot be taken away. Rights are inherent and are exercised. Rights are never taken away, they are only ever violated. The greater the infringement upon rights, the greater the violence. Colonialism and slavery infringe upon every possible right and freedom and therefore, require maximal violence. Rights also only need to be articulated when they are violated or threatened with violence. Until then they are understood and customary. You only need to articulate the right to breath when it is being infringed upon. The lack of democratic, community-led decision making in disaster response led by state and corporate forces bulldozes a path to recovery that leave the people and the land insufficiently cared for, and trapped in an extractive system that continues to exploit them. Peoples’ inherent rights are violated at every step of the process. In the face of that system, we must assert our rights with or without ‘permission’ – to keep people alive, while simultaneously transforming the relationship of power that keeps those resources from the people even before and beyond moments of disaster. Just Recovery efforts across the globe show how peoples in moments of disaster are rightfully asserting their rights to clean water, reclaiming control of land, and reclaiming democratic control of their schools, neighborhoods, and cities. 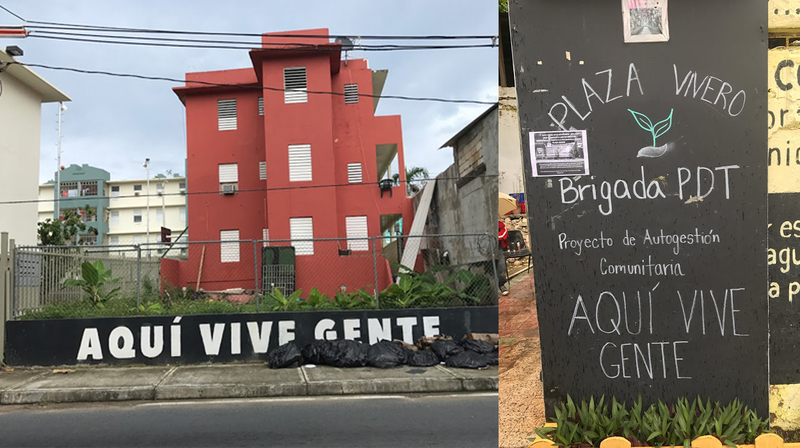 They are rebuilding their communities in the wake of disaster by exercising their right to those resources – both as a necessary act of disaster collectivism and survival, as well as a revolutionary strategy to reclaim those rights for the long-term. Through those acts of rights-based organizing, they are forging a path to a Just Transition towards regenerative economies where those rights, and the Rights of Mother Earth, are exercised, honored, and codified. Just Recovery efforts must drive towards reparations for over 500 years of colonialism, genocide, and slavery – a root cause of the massive disparity in vulnerability and in access to resources amidst disaster. For 500 years, a sadistic and vicious war has been waged against melanin-rich people of color primarily from the Global South via the Transatlantic Slave Trade, the Genocide of Indigenous people, and European colonialism. The labor of Black and Brown folks around the world, and its products, were forcefully taken for generations, for the accumulation of wealth by others. This extraction of wealth – from their labor, and from the land – formed the financial basis of the modern globalized world economy and created the extreme socioeconomic disparities we are appalled by today. This system of oppression also actively engaged in the destruction of our ecosystem through the theft of land and the theft of people. The original harm has not been healed and in fact, the extraction of lives, our work, our culture, our language, our children, our homes, and our dignity continues both here and abroad. The magnitude of economic and ecological destruction that Black, Brown, and Indigenous people experience amidst disaster are a direct consequence of this history. Reparations must mean more than restitution for past harm. True reparations means repairing our relations. We must not only make amends for past harm, but we must reorganize the very nature of our economy so as to create new relationships going forward such that the harm can never happen again. In the aftermath of disaster, peoples are faced with the challenge and opportunity of reclaiming home – from the physical reshaping and rebuilding of it, to the weaving of a new social fabric that defines their relationships. 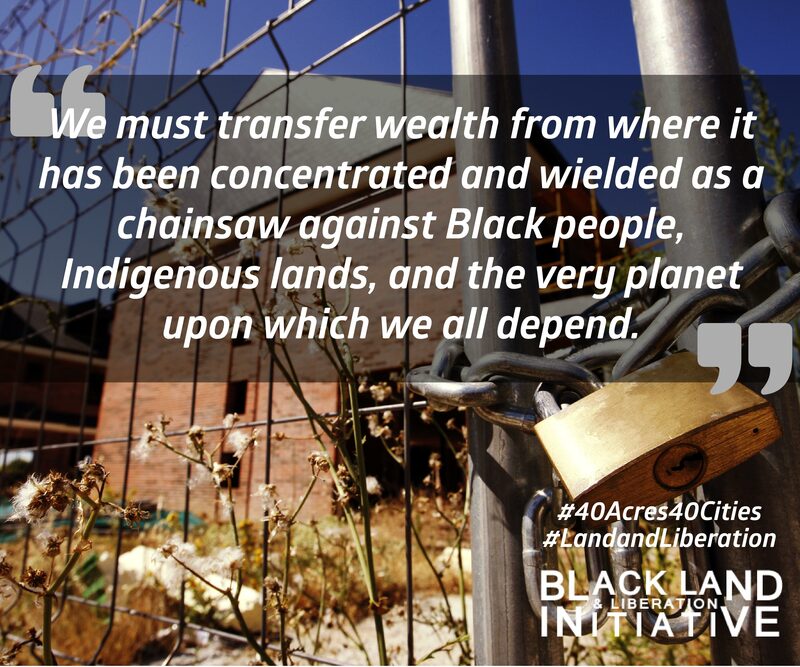 We know that productive land-based reparations must be provided to those that have been historically disenfranchised along with the necessary resources to sustainably develop that land. Ensuring that reparations for past harm and hurting are fundamental to how we meet people’s needs in moments of crisis and how we reimagine our economy moving forward is fundamental to the definition of Justice. 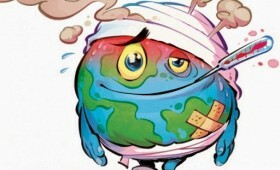 Disasters remind us of our interdependence on the whole of the web of life. They show us how we depend on ecological well-being to build the resilience we need in moments of disaster, while simultaneously making it clear that extractive human development has created the instability of the planet’s systems and amplified the frequency and intensity of the disaster themselves. If Just Recovery efforts deploy root cause remedies that set us up for a regenerative, more resilient future, then that demands a sense of ecological wisdom at the forefront. We cannot replicate the human development patterns that have historically stripped communities of their resilience, that have bulldozed our historical, ancestral connections to the lands we depend on. Instead, rebuilding home offers an opportunity to integrate and honor traditional ecological knowledge, regenerative design, and to build infrastructures with the goal of restoring balance for seven generations to come by relying on the wisdom of the seven generations before. This requires that we honor and follow the leadership of the culture keepers, land-based workers, and resilience practitioners of disaster-impacted peoples. This requires a reclamation of power and resources to be given to those on the frontlines, to be able to lead such efforts. This also requires that we honor and follow the wisdom of the wetlands and water-ways; of the forests and fauna. The design principles for a Just Recovery are written by the living world and found only through healthy ecosystems. This excludes those who are salivating at the opportunity to rebuild communities for the sake of profit and extraction, except in their role in repairing relations through reparations and in supporting those who have historical connections to the lands that they are on. From immigrant day laborers in Northern California to school teachers in Puerto Rico to small farmers all over the world who know the land so intimately – these are the invaluable frontline leaders of the Just Transition. They are the teachers that carry wisdom on how to navigate crises; they are the first, second, and third responders that heal their people and the land, and, in the wake of disaster, they are the midwives that usher in another more vibrant, beautiful world which we know is possible.